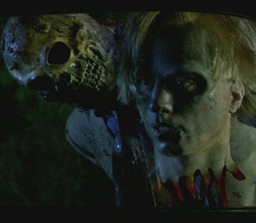 flashzombies.com - "Dance of the Dead (2004)"
Lately I've been disapointed with the newer zombie films, but this movie is different.I recommend seeing it because it is fun and features zombies killing a bunch of dressed up prom kids which is awsesome in my book. The Beginning scene takes place in the day in a graveyard, close to a nuclear power plant.The caretaker of the graveyard is cutting off the body parts of zombies as if it is an everyday thing,which I think would be a fun job. This movie is part of the "Ghost House Underground" collection. Not really sure if this movie could be considered horror, because it had alot of funny parts. A great scene is when the frogs come alive and kill the teacher nobody liked. He got what was coming to him, a life of BRAINS! 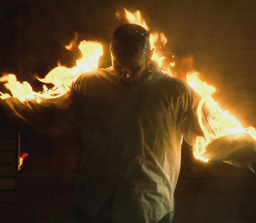 So try this movie out, rent it, own it if you find it for a low price. It's always good to have a good zombie movie for when company calls. This movie has alot for everyone. Crazy gym teacher, cheerleaders, the geeks of school, rock bands, and best of all lots of zombies! 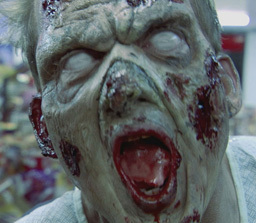 One great addition to this movie that you don't find in others is that zombies loved music in the film. If they heard music, they would huddle around it and stop attacking and eating flesh off of peoples bones. One of the bands in the movie played 5 hours straight to stay alive before help came. Maybe I should learn how to play guitar. What do you think of this movie? 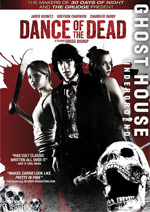 Click here to discuss Dance of the Dead (2008) in our forum.